Researchers at the University of Michigan in Ann Arbor, Michigan have developed a new method for bracing high rise concrete buildings. By reinforcing the concrete with steel fibers, they were able to design coupling beams (beams used to connect walls around openings like windows and door frames) that are both easier to construct and more effective than traditional coupling beams. A test structure using these new beams was shown to be able to withstand a fake earthquake stronger than any real earthquake ever recorded. Openings like windows, door frames, and elevator shafts tend to weaken a structure. Coupling beams try to mitigate this weakness by providing extra reinforcement in the vulnerable areas. The new beams with steel fibers require less coverage to effectively bolster these openings. Using a test structure of a 40 percent replica of a four story wall, the beams withstood a peak load of 300,000 pounds with a three degree drift (a measurement of the movement of the top of the building versus the bottom of the building). Even in large earthquakes, buildings rarely experience more than a one or two degree drift. Designed by Professor James Wight of the Department of Civil and Environmental Engineering at the University of Michigan and several of his colleagues, these new fiber-enforced coupling beams have several other advantages over traditional beams. Current coupling beams must be cast on site, usually built bit by bit as skyscrapers are erected, and require complex reinforcing bar skeletons. The steel and concrete bars can be cast ahead of time off site without such cumbersome reinforcement. In addition, any cracks in the new beams are much smaller since the inch-long, needle thin steel fibers hold the beams together. In addition to being stronger, easier, and more effective, the steel fiber reinforced beams are also expected to be less expensive than the traditional coupling beams in widespread use today. 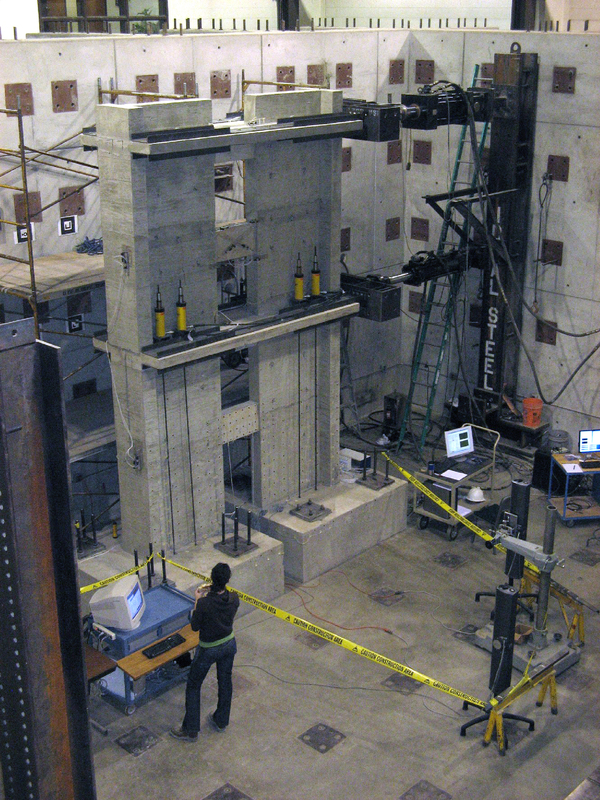 The success of the initial test, conducted at the University of Michigan’s Structural Engineering Laboratory facility, which was designed and specially reinforced for earthquake testing, prompted researchers to plan to install the beams in several high rise buildings scheduled for construction on the west coast of the United States, where earthquakes are most prevalent. Presumably wider adoption would follow if the beams are successful in the currently scheduled projects. TFOT has previously reported on other innovative civil engineering projects and construction materials including waterless concrete that could be used to build structures on the moon, a powder composed of concrete, quartz sand, and other compounds that create a waterproof layer on top of other building materials, a Roman church that removes organic contaminants from nearby air, and a light-transmitting mixture of concrete and optical fibers. Read more about the steel fiber reinforced coupling beams in this University of Michigan press release. Read more about the University of Michigan Structural Engineering Laboratory and its earthquake testing features on its facility page.